In Hong Kong, meal deals and high-quality nosh rarely make it into the same sentence. We’re not getting paid to say this, but AsiaXPAT’s Super Mondays, where you nab 2-for-1s on all mains every Monday (i.e. you enjoy two mains for the price of one) is a rad deal. Curiously enough, most restaurants participating in this promotion are part of the Dining Concepts empire, but honestly, that’s a plus in our book given the calibre of nosh that they dish out. To be eligible, for the promotion, you need the actual physical card, which you can get it mailed for an one-time fee of $88. Kinda annoying, but hands down, worth it, considering the savings you'll bag. Here's the complete list of restaurants participating in Super Mondays. Get whisked to the heart of Italy in this handsome Central eatery designed by celebrity chef Enrico Bartolini. Look for delish Bartolini classics including his to-die-for Risotto Agli Agrumi Con Crostacei: a citrusy risotto served with a side of squid ink and mixed seafood. If pasta is not your thing chow down a few slices of pizza: the Formaggi e Tartufo Nero or creamy cheese pizza with generous slices of black truffle is something you won’t find anywhere else...in the 852 atleast. 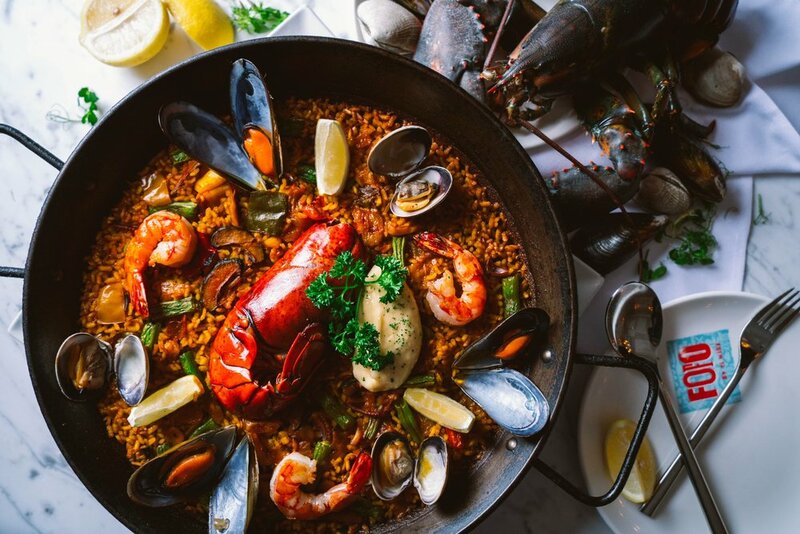 Contemporary Spanish hotspot, FoFo brings the best of Spain to Hong Kong thanks to head Chef Alex Fargas’ travels around Spain and his hunt for new culinary inspirations. We love the delicious Iberian specialties including Fried Croquettes of Iberico Ham, Steak Tartare with Bone Marrow, and Crispy Suckling Pig, here. Finish the meal off with a handful of warm, chocolatey goodness: Churros. With a menu selection devoted to charcuterie and fromage, there’s no place other than Bouchon to indulge. If you’re looking for something a bit more filling, make sure to zero in on the Moules a la Mariniere (Blue Mussels with White Wine) and the Confit de Canard (Duck Leg with Sautéed Potatoes). Personally, I think this restaurant is a bit tacky, decor-wise unless zebra-printed sofas are your thing. Furnishings aside, Gaucho boasts surprisingly well executed Argentinian dishes. Since steak is the highlight here, you’ll get a choice of four raw cuts brought over to your table: lomo (fillet), ancho (rib-eye), chorizo (sirloin), and cuadril (rump) for your choosing. Pair your meat with a choice of carb-heavy sides (read: Baked Sweet Potato, Fat Chips, Mashed Potatoes). This popular shisha spot on Wyndham is right up there in terms of one of the premier happy hour spots around to grab a drink or two. But, Lilya also churns out Moroccan specialities such as Chicken Mquali, Lamb Tajine, and Traditional Pastilla. A solid choice if you’re looking to tuck down a few plates of Middle Eastern nosh. With a deliciously balanced menu of flavours and textures, Pacific Place’s BIZOU features classic American fare (think: Boston Style Crab Cake, USDA Cuts, and Spaghetti Au Ragu). Given that it’s housed in a massive shopping mall complex, BIZOU does quite well with its interior digs, featuring walnut wood panelling and tiled walls all around. There’s an entire section of the menu dedicated to cuts, so make sure to choose wisely. Our pick has to be the 32 oz USDA Prime Porterhouse, topped with generous servings of crumbled blue cheese goodness, and pearl onions. Just minutes away from the Central escalator, Soho Spice dishes out Vietnamese and Thai-inspired dishes, with a western twist. Lamb Rack in Red Curry Paste, Grilled Beef Sirloin, and Crispy Fried Salmon are all must-try dishes in anyone’s book. Tuck down some Mango Sticky Rice or some Thai Custard Pandan Cake post-meal, and you’re set! Look for freshness and quality at this Dutch gem of a restaurant. Start your meal off with their signature Applewood-smoked Eel Fillets: rich and fatty, with just the right amount of smoky flavour. For the mains, you can’t go wrong with their Oven Roasted Lamb Shanks (think: perfectly tender and juicy meat with a hint of rosemary, sage, and thyme butter) as well as their Roasted Organic Chicken served with a side of Sautéed Mushrooms, Caramelized Carrots, and Thyme. Mezze. Hummus. Halloumi. It’s nobody’s guess that we’re at Soho’s Olive to tuck down a few bites of Greece’s finest. Forget the mass-produced hummus at City Super, Olive, satisfies any hummus aficionado's cravings. Off their A La Carte menu, their Pan Fried Barramundi, perfectly seared with a golden brown finish as well as the Stewed Lamb Shank with spiced chickpeas, potatoes, and the gang are great catches. Renowned for their open fire cooking thanks to a custom made charcoal fired grill, Craftsteak prides itself with only the freshest cuts, jet-fresh from Down Under, Canada, and America. Choose from a selection of grass- and grain-fed cuts, paired with a choice of flavourful sauces (hint: Make sure to choose either the Moonshine BBQ or the Truffle Béarnaise from eight on tap). All meats come with a generous serving of sides such as Creamed Spinach, Ash-baked Sweet Potatoes, and Shoestring Fries. With outposts in Dubai, Tokyo, London, and counting, Ramsay’s Hong Kong flagship showcases dishes curated by the infamous hot-tempered chef. Obvious choices here include Gordon Ramsay’s version of the classic steak dish: Beef Wellington, a show-stopping centrepiece for any ocassion. Phuket trip in the works? Hit up nahm for a taste of what’s to come. Located in the sprawling Elements Mall at the ICC, nahm featured a medley of Vietnamese and Thai cooking--in one. Be sure to try their Baby Back Ribs (who doesn’t like fall-off-the-bone tender ribs with a mix of tamarind chili and caramel pineapple?) and their Grilled Sea Bass with Oyster Mushrooms and Vegetables in a Yellow Curry. This two-storied hotspot located just off the main Tsim Sha Tsui drag dishes French-inspired plates, blackboard menus, and a blinged out kitchen. Their Duck Leg Confit is fork-tender, but has one of the crispiest, crunchiest skin you’ve ever seen. They also have great value wines on tap, and a rotating selection of cheese straight from France. Situated right by the water in East Tsim Sha Tsui, Gordon Ramsay’s London House features an all-day British menu featuring a hit list of U.K. faves such as Fish & Chips, Shepherd’s Pie, and Burgers & Mash. You can’t go wrong here. With most Mains under $200 a pop, you'll sure grab a bargain, here! 31 stories up on the V Point Tower in the heart of Causeway Bay lies ALTO. This Tom Dixon-designed space, boasts a menu featuring classic grill dishes with your standard cuts--Ribeye, Sirloin, Skirt, and the like. Argentinian Grass Fed Sirloins aside, don't forget their Black Truffle Pappardelle, here.